I agree that the media is complicit in not revealing the ongoing lying of the LNP. Murdoch especially is complicit as it suits his ends to support a LNP government. The media is much more critical of Labor and their policies than it is of the LNP. Scott Morrison has had little media criticism of his outrageous remarks about the “criminals pedophiles rapists and murderers” of the Islamic religion when trying to stoke up resentment and anger toward refugees on Manus and Nauru who might be transferred to Australia because of extreme illness. There was little criticism of his hypocrisy when he made his comments after the tragic terrorist act in New Zealand. The media also skimmed over Barnaby Joyce’s role in the destruction of the Murray Darling Basin due to his ineptitude. The only media organisation which addresses these lies is the ABC and they are pilloried by the government and have their funding cut to render them toothless. The LNP want to be rulers for life without any opposition. They see people on welfare as not worthy and people with wealth as worthy. They are cruel towards those less able to manage their lives and make it as difficult as possible to access help and support. I loathe this government. The COALition are better economic managers ? Ha! Rest of the corporate MSM = bought & paid for Media Mercenaries, of the IPA. They did the same crap under LeatherJacketMan Turnbull, with Morrison shouting all the way in 2016. Managed barely to retain 1 seat, lost 14. Now it’s even more negative, completely over the top, lies & only lies, and just Morrison fronting … um, something about the same thing again & again yet, expecting a different result ? This nasty government depends on the support and misinformation and obfuscation provided by Murdoch and his dirty minions, Ch 7 and Kerry Stokes, the fools on Sky , and now Ch 9 with that gutless failed treasurer Peter Costello as its inspiration, who now casts his malignant influence on the once Independent Always SMH so that it too toes the coalition line. Then there are the so-called notable media identities who pretend to be impartial but are anything but, even the Guardian has one such journalist in the form of Katharine Murphy. Perhaps the Nat$ can explain why the Minister for Water allows the following to happen. Oops silly me ….. there is no conflict of interest when an MP trades water in the market dominated by foreign owned multinational mining corporations having little regard for the food and for production in Australia. Rich brats who think Government is their very own cubby-house. The truth, this COALition cannot handle the truth! Not ONE of any of the incompetent bloody rabble could tell ANY “truths”, even if their life depended on it! Sadly though, far too many voters here in Australia actually believe everything this bloody COALition sprouts, & they vote accordingly. I just hope that there are more than enough “normal” voters to ensure that Labor gets in, & with a majority too! God help Australia IF this rabble gets re-elected, & I am not religious! Great article John! The lies today are no longer subtle but brazen. They don’t care if caught, they keep on repeating the lie. All are easy to catch out, generally in minutes. Most don’t make sense. Are we the public idiots or are they. Let’s face it, if a coalition politician told you the sky was blue you would want three written submissions from the Bureau of Meteorology, two Stat Dec’s and a packet of Tim Tams before even considering the proposition to be true. That said the one and only good thing about living in a pretty safe Nats seat is the letter box remains relatively free of those glossy electioneering pamphlets throughout the campaign. The ones that make it past the ”no junk mail” signage are consigned to the big green bin unwanted and unopened. Scummo’s “truth campaign” didn’t even make it halfway through the first day and he still expects us to believe he’s as honest as honest can be. SNORT! It has been reported that three Liberal ladies preselected for seats in Victoria may have major dual citizenship issues, those named are Vaishali Ghosh in Wills, Helen Jackson in Cooper and Kate Oski in Lalor. However Josh said this is a Labor smear as Liberal people don’t make these sorts of errors. Two have been forced to withdraw their candidacy (One an IPA drone), the third having refused to do so will be dis-endorsed(Not a good look). Expect more of the same to follow, the Libs only vet candidates ‘properly’ after nomination, and Lib preselections are still in progress. Melissa Parkes gone ……. NO ONE is allowed to say anything that in any way shape or form could be seen as kind or caring or sensible towards Palestinians or a two state solution in Israel-Palestine. Every Australian politician must swear obedience to Zion and the divine right of Yahweh’s peace loving army to remove every trace of those vile Canaanite cockroaches from the Promised Land. Just saw it at FB SMH. Apparently to do with remarks about us being the one place apart from the USA not yet come to a recognition of Palestine. Surely Labor itself would not have so cowardly gutless as to drive Melissa Parke out? whoops wrong, that was Louise Pratt, never mind. I so have to vomit after the spinelessness on so many fronts re politics the last few days. That link is incredible. I am amazed it isn’t headline news. Add to it, Angus Taylor gave the Liberals $155,000 in five separate tranches in 2012-13. The reason I will keep clear of as much election coverage as I can is because I can’t tolerate the lies. 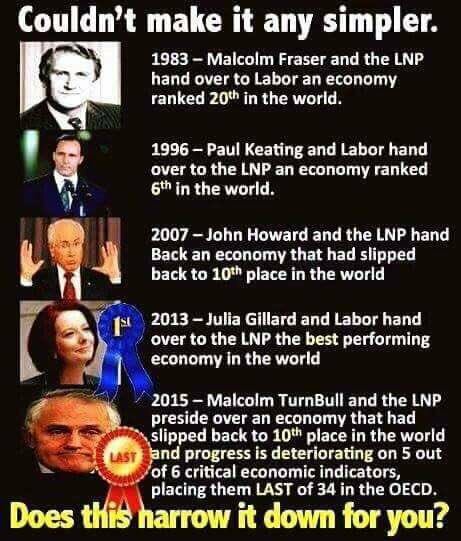 Does anyone really believe the LNP will deliver a surplus if reelected? Does anyone believe, after their creative accounting on climate change emissions and their “meeting targets at a canter”, that they now have a grasp on reality? I fear that too many will forget and say “I do” and we will have to endure another 3 years. I fear for my grandchildren. Not as incredible as the ALP yellow streak concerning Parke. That is also a worry. But Angus Taylor getting $80 million from Barnaby Joyce is even moreso IMO. So explosive it cost the author their Twitter account. Even we here get threatened with lawsuits when we write about water buyback shenanigans. This is getting way out of hand. I am passing on the information to someone who may be able to follow-up. Really. The link you read, that NEC provided is the ‘archive’ of scrubbed data, a redundant archive of the twitter account proactively/periodically created for such an eventuality, thence recovered & retained by the Wayback Machine(Internet archive). We do not have the resources to fight legal battles. When we have been threatened, we have removed stories because there is always another one to write. But the truth gets out there. The Parliamentary Budget Office was set up in 2012 by Peter Costello to “inform the parliament by providing independent and non-partisan analysis of the budget cycle, fiscal policy and the financial implications of proposals”. The need for this body, as I understand it, was to allow political parties to have policies costed independently because to have Treasury do the work would compromise the Dept. of Treasury as they can only act at the behest of the government of the day. The Liberals fed information to Treasury and asked for them to cost it. It just so happens that the information was loosely based on Labor policies. Treasury reported back to their masters and Morrison used that information (we haven’t seen it) to slam Labor policies. When asked by Chris Bowen why they were costing Labor’s policies Secretary for Treasury Gaetjens replied with confirmation the department prepared the cost estimates, but he made it clear these were based on instructions from the government, without being told they were Labor policies. “We were not asked to cost another party’s policies and would not do so if the request was made specifically to ‘cost Party X’s policy’,” Mr Gaetjens wrote to Mr Bowen. Labor have had their policies independently costed by the Parliamentary Budget Office which is the correct and appropriate thing to do ; that’s why the agency is there. The Liberals have corrupted the very system they set up to avoid this sort of thing happening ! Truth telling, a much too big ask, John Kelly…..
To tell the truth, you have to know it…it’s not about making it up as you go along…..
helvitinyi: Wrong! You can make it up as you go along and claim it is the truth. And then you repeat it and repeat it, and lo, and behold! It becomes the truth! And people have been doing it for millennia. It works. Sorry, but that is also the truth.